Tibetan Quartz hold sacred, harmonious and balanced energy. High quality, with a close to flawless exterior! It is very smooth, rich, pure transparency and energy! A wonderful gift of love to a special person or to yourself! These are super super quality. They stimulate clairvoyance and telepathic communication; Help create harmony and awareness; Can store information/emotions; and alleviate tension. 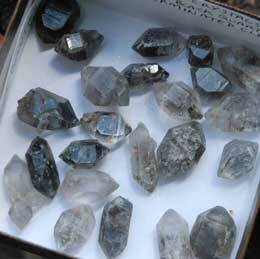 Tibetan Black Spot Quartz is a master healer. Lemurian crystals were planted in a grid pattern over the earth’s surface, on stars and in other dimensions, to be found centuries later by us. Small rods or needles for jewelry making. Good for clearing auras, dissolving blockages, balancing all chakras, and healing the heart. Brings the right and left side of the brain into balance. Supports immune system and joy of life. Price: approx $4/ct. These special 12 and 24-sided cut crystals are tuned quantum converters for accessing and using refined, natural quartz energies. Excellent for transformation and enhanced focusing, amplifying, and transmitting of healing energy. Use to restore energy to the body, stimulate personal growth, and reconnect with inner levels of the self. Highly effective meditation aids. They are used when the need is great. For spiritual rebirth, 24-sided cut crystals focus your thoughts & transmit them within the higher realms. Crystal – A neutral object whose inner structure exhibits a state of perfection and balance. For more information about Marcel Vogel and how to use crystals for healing, check out the U-tube videos of his classes. They cover how quartz amplifies and coheres vibrational frequency, the power of human love, and more. Clear quartz, a master healer, amplifies other energies and attunes to your vibrational needs. 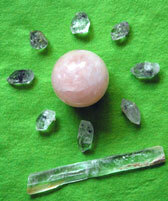 The ball form radiates energy in all directions, making this a fabulous crystal for seeing into other realms and communicating with spirit, or for group gatherings. This super-grade clear quartz sphere has a rainbow in it and is 3″ in diameter. $250.